Oliver van den Berg’s installation Tusks contains components which, from his perspective, are unusually moralistic-political in nature. The visitor’s eye – or is he or she the discoverer, or perhaps even the culprit – falls on a collection of brightly shimmering tusks. A scene familiar to us from police raids on poachers in Africa. But now, however, it is the visitor who unwittingly finds him – or herself in the centre of attention. As we come closer, our shock is transformed into astonishment, as well as the realization, that this great mass of tusks does, in fact, consists of wood. They have been fashioned by human hand and not brutally wrested from nature. Despite this, not one of the ostensible trophies resembles the others. 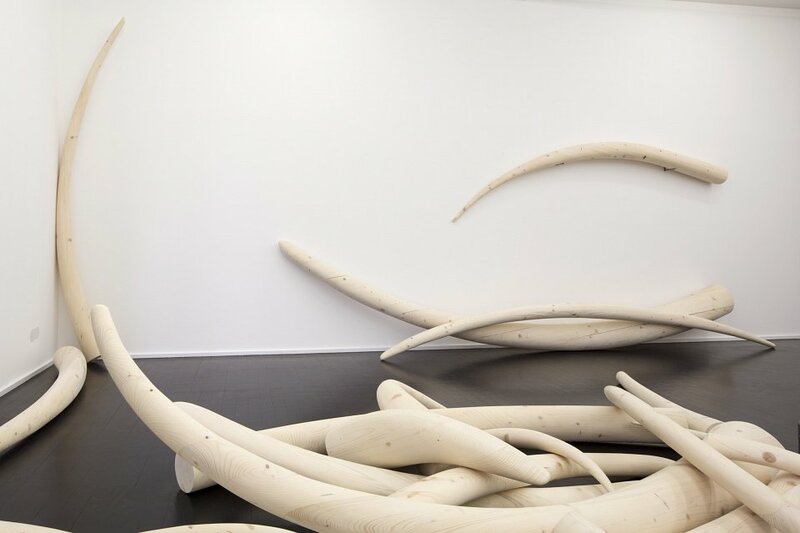 Each tusk differs from the others in size, proportion, scale, curvature, cross-section, the composition of the spruce, the glued sections and the grain of the wood. And just as there is no end to the infinite number of forms in nature, nor is there any end to Oliver van den Berg’s series either. 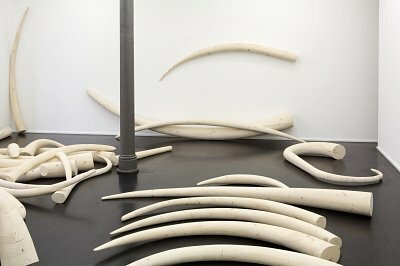 By integrating the ivory into a sculptural concept and assigning it to art, he succeeds in raising basic questions relating to valences, significance, legality and consumption. This raises an issue quite typical of Oliver van den Berg. The question of originality and the constant repetition of a thing, linked with the search for essence of a unicum and why it is able to elicit such covetousness. 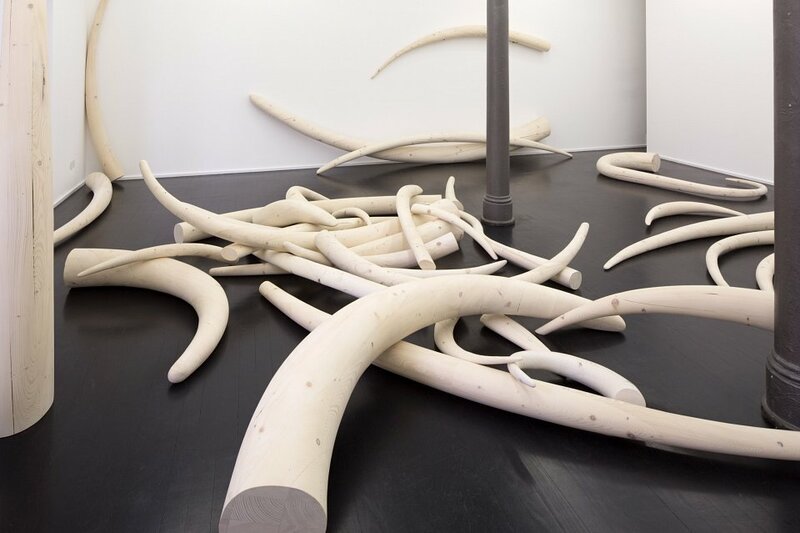 By consistently clustering or replicating an object, Oliver van den Berg elicits a direct response from his recipients. The great number of similar objects leads to a direct awareness of comparisons, classifications, observations, recognitions, digressions and analyses. From there, he finally arrives at the question of the various modes of viewing a phenomenon, in which the relationship of the unique is thematised to create its own constant repetition. 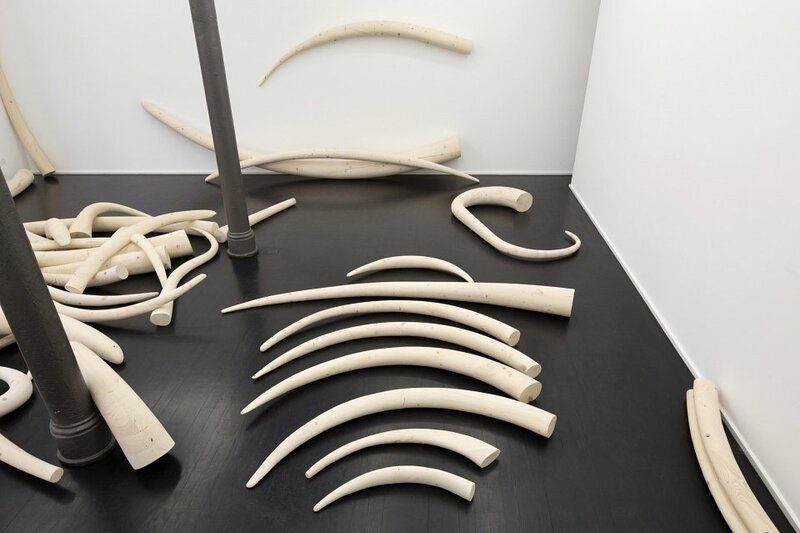 On closer observation, however, the attentive visitor finds objects with which the artist begins to fracture the repetition. Alongside the alleged emulations, there are objects whose form may well derive from a model of the elephant’s tusks, but are, however, formed in accordance with formal abstract specifications. 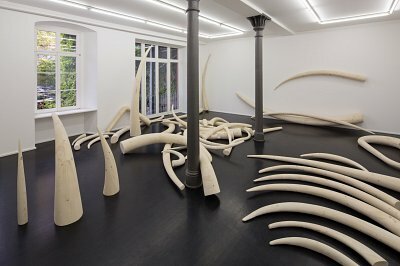 These formal tusks are derived, in turn, from the formal qualities of the tusk – size, proportion, scale, curvature, cross-section – transforming them, however, in every direction imaginable. 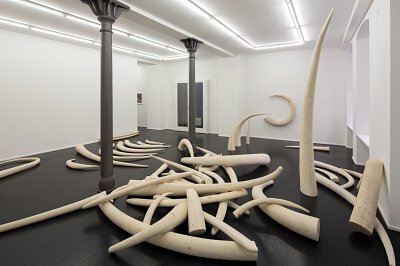 With his Tusks, Oliver van den Berg uncompromisingly contests originality, only to make it absolutely conspicuous a moment later. 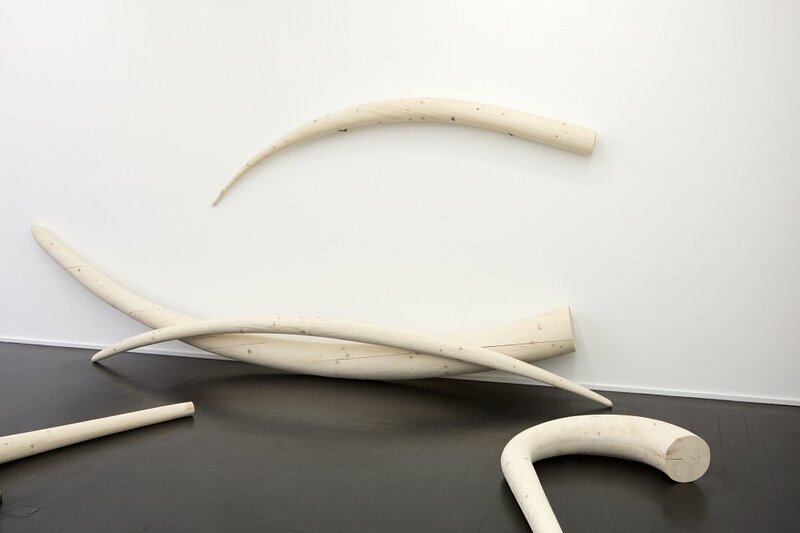 The artist pursues his own sculptural approach to the reproduction of existing object and, by applying his own formal creations, breaks with his own formal creations. He challenges the recipients and encourages them to assume a role inside the installation and reflect upon it. 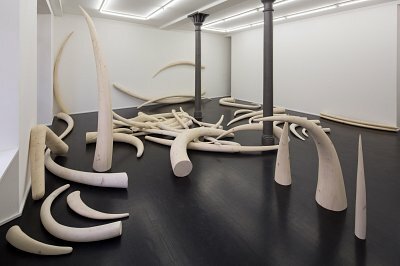 At the same time, he liberates the tusks from the domain of illegality while simultaneously preserving their trophy-like character by situating them in the realm of art. In so doing, he ultimately succeeds in establishing an important and not-to-be underestimated quality of this work: ambivalence.